I know you are probably in full swing, having your Thanksgiving table already planned and ready to be set. I wish I could say I was right there with you...but I still have to go grocery shopping and there is NOTHING worse than grocery shopping on the day before Thanksgiving. In the meantime, I plan to spend the day finishing up my Thanksgiving plates. You'll remember my crazy obsession with decorating plates lately. I made a set for Back to School and one for Halloween and now I'm in the process of a set for Thanksgiving. 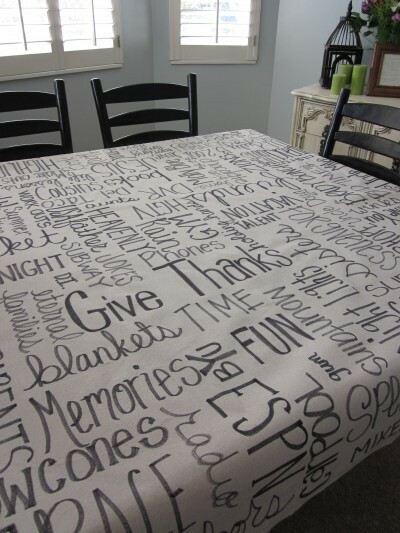 When I saw this awesome tablecloth from Becca at Blue Cricket Design, I REALLY, REALLY wanted one, but I can't even imagine the time and effort it went in to making such an heirloom. So I went a little smaller. I started by making a list of all the things I could think of to be grateful for. I listed everything from my kids to my parents to personal things such as Koolaid and Red Gummy Bears. Then, I added each one of those items in a Subway art style to a plate using a Sharpie Marker. I used different font styles and different directions and different styles. When I was all done, I baked the plate for 30 minutes at 350 degrees. Now I have a unique and personal Thanksgiving plate for my table.